Alex Morgan celebrates her 100th goal (Photo: USWNT Twitter account). The USWNT had a big test on Thursday night against the Matildas, another World Cup favourite. 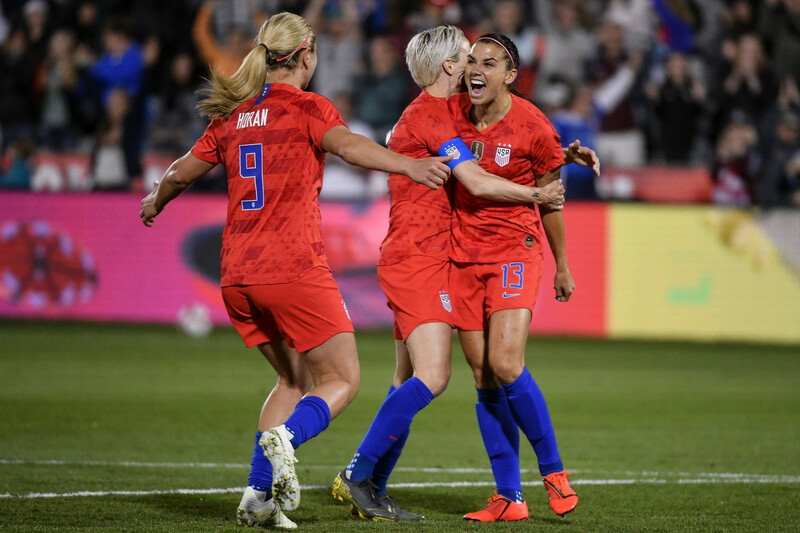 Things turned up well in the end for the hosts and we could see USA offensive power again but the defence remains the head-scratcher for Jill Ellis. 63 days separates us from the biggest event in football: the World Cup. And this match up between USA and The Matildas was a big clash we all expect to see again in the final stages of the tournament, if not in the grand finale. The game started pretty well for the US, with high pressure and possession of the ball, looking dangerous in the third half. So much so that the first goal for the hosts came up early, in the 14’. But it was no ordinary goal, since it marked the number 100 for Alex Morgan. A showy display of what Morgan did and can do as a forward: boding off Polkinghorne, beating Kennedy and putting that ball in the back of the net, giving goalkeeper Lydia Williams zero chances of stopping her shot. The Matildas weren’t looking so good, with a midfield that couldn’t connect with her forwards, there was little they could do against the US pressure. But a combination made of Sam Kerr and Caitlin Foord against Julie Ertz prevailed, and Foord sent the ball to a wide open Lisa De Vanna. The defence gave the experimented player too much time and space and she didn’t have any problem in putting that ball in the back of the net, scoring the equalizer. From that point on, things looked brighter for the Matildas who couldn’t do much against their opponents before that. Lisa De Vanna served the perfect ball to Kerr but the captain couldn’t connect with it and minutes later the forward broke free from the mark of Dahlkemper and Sauerbrunn to make her shot but Dahlkemper recovered well and blocked it. The US also had two good opportunities in the feet of Tobin Heath. She took advantage of her speed, beating her defender and went to the end line with tons of time and space to decide what to do to. Sadly, both opportunities ended up in nothing. The score was even at half time although the US looked better in the first half, dominating the midfield. The first minutes of the second half were great for the Matildas, with Foord's goal, putting the Aussies up in the score. Caitlin Foord spun to drop Mewis out of her way and kicked the ball inside of the US box with the defenders just looking at her shot. After that Megan Rapinoe received a yellow card.... things weren’t looking good for the US, but a Portland Thorns connection evened the match again. A great ball from Sam Mewis to Megan Rapinoe who looked for Heath in the box but find Emily Sonnett in the other side instead, sent the ball to the far post where Heath was and she headed it to put things 2-2. Rapinoe gave the US the lead again with a fantastic goal outside the area, using her body to fool the defender and create space for herself to shot the ball. The pace of the match started to decrease after that, with many subs coming in into the match, among them Mary Fowler, the 16 years old matilda, for Caitlin Foord. Mallory Pugh came into the match too, replacing Megan Rapinoe and she scored in her first touch (67’). A beautiful play got Emily Sonnett passing the ball to Alex Morgan, who returned the favor with a back heel and then Sonnett assisted Pugh in her first goal of the night. Nonetheless Sam Kerr, who had a quiet second half, sparked things up in the 80’. Hayley Raso, who came into to match for Kellond-Knight, sent a great ball to her teammate and Kerr, headed it to put the score 3-4. When the match was almost over, Alyssa Naeher sent a long and precise ball that got to the feet of Pugh and she scored her brace in front of her home crowd. First and foremost, both defences have serious problems. The US and the Matildas are considered top teams in the world and although we had fun watching the game, 8 goals were conceded and that cannot be happening given the proximity to the World Cup. Now that both teams have terrific attacking thirds, improving the defence should be a top priority for both coaches. Second: the Matildas depend too much on Sam Kerr. And it’s natural for it to be, but that dependence can get the team in serious problems. We saw a lack of ideas in the Aussie attack, and they had problems to pass the US midfield. But time is running out and they need to solve that before is to late. Third: Emily Sonnet in the attack is a valuable asset but she still needs to keep working in the defence, where she’s supposed to excel. The good thing is that this matches, where Kelley O’Hara is out because of injury, are making Sonnett more confident in what she can do and are showing her what needs to be done to have a spot in the roster that is going to travel to France this summer. Otherwise, Ali Krieger is sitting in the bench right now and she knows everything about being a right back. Next game for the US is going to be on Sunday, against Belgium. USA: Alyssa Naher, Emily Sonnet (79’ Tierna Davidson), Abby Dahlkemper (85’ Carly Lloyd), Becky Sauerbrunn, Krystal Dunn, Julie Ertz, Lindsey Horan (64’ Christen Press), Rose Lavelle (Sam Mewis, 2nd half), Tobin Heath, Alex Morgan (81’ Allie Long, 90+1’ yellow card), Megan Rapinoe (49’ yellow card, 66’ Mallory Pugh). Matildas: Lydia Williams, Gema Simon, Clare Polkinghorne, Elise Kellond-Knight (68’ Hayley Raso), Caitlin Foord (75’ Mary Fowler), Lisa De Vanna (57’ Emily Gielnik), Tameka Yallop (90’ Katrina Gorry), Alanna Kennedy, Sam Kerr, Ellie Carpenter.